The rising Korean trend is increasing in popularity among Hong Kong consumers. Eight out of ten millennials fancy Korean trends, according to Nielsen’s Japanese and Korean Trends report which traces Hong Kong consumers’ perception about the popularity of Japanese and Korean trends. With the emerging popularity of Korean dramas, movies and k-pops, the prevailing pop culture has shifted from Japan to Korea. The popularity of Korean trend has overridden the Japanese trend with over 50% of respondents aged 18 to 54 feeling that the Korean trends will continue to be popular in the near future, and this is more skewed towards female respondents (80%). The report shows that respondents with an income of more than HK$25,000 are found to have a stronger recognition of Korean trend and are more likely to have visited Korean at least two times in the past year (88%). Although surveyed respondents’ current trip spending on Japanese products is still 30% more than that of the Korean products, with Korean products getting more popular in the market, and Korean brands being widely accepted by consumers, around one-third of the respondents claimed that they will be increasing their spending on Korean products in the near future. 28% of respondents claimed they will purchase Korean fashion product, over 40% claimed that they will increase their spending. Meanwhile, one-third of the respondents claimed that they will purchase cosmetic products, and among them, 37% will increase their spending. This rising trend has shown a great potential for the Korean retail market to come. The report also finds a growing popularity of Korean food for Hong Kong consumers. A respective 80% of female aged 25-34, millennials and with an income of around HK$25,000 to HK$49,000 will buy Confectionery, Packaged Food and Cooking needs during their next trip to Korea. Hong Kong consumers’ interest in Korean food products open up the new opportunities to be introduced in Hong Kong. The potential for Korea is more to be unleashed. According to Korea Tourism Organization 2017, there is an average of 600,000 tourists travelling to Korea every year with the Korean cosmetic products accounting for 25% of China’s total cosmetic import. According to 2016 Forbes, the economic impact of K-pop star BIGBANG is expected to be a pretax earning of US$44 million. According to the report, the key driving factors behind Korean trend popularity is found to be mainly coming from entertainment (76%), followed by fashion / personal care (71%) for millennials being the target customers. “The Hong Kong economic environment has remained stable over the years and has been well-supported by the consumption of over 42.8 million of mainland visitors coming to Hong Kong. With the Korean market slow emerging in Hong Kong, Korean brands can succeed and win Hong Kong customers’ buy in by being more customer focus, showing emphasis on product quality and charging a premium with innovation. This will certainly open up a new market for opportunities to come,” said Michael Lee, managing director, Nielsen Hong Kong & Macau. The report shows that this target group values products that appeal to fit their need (41%) most and expect the products to be trendy and imagery (34%). Innovation (31%) and product quality (31%) are also key strengths that they are looking for from Korean brands. 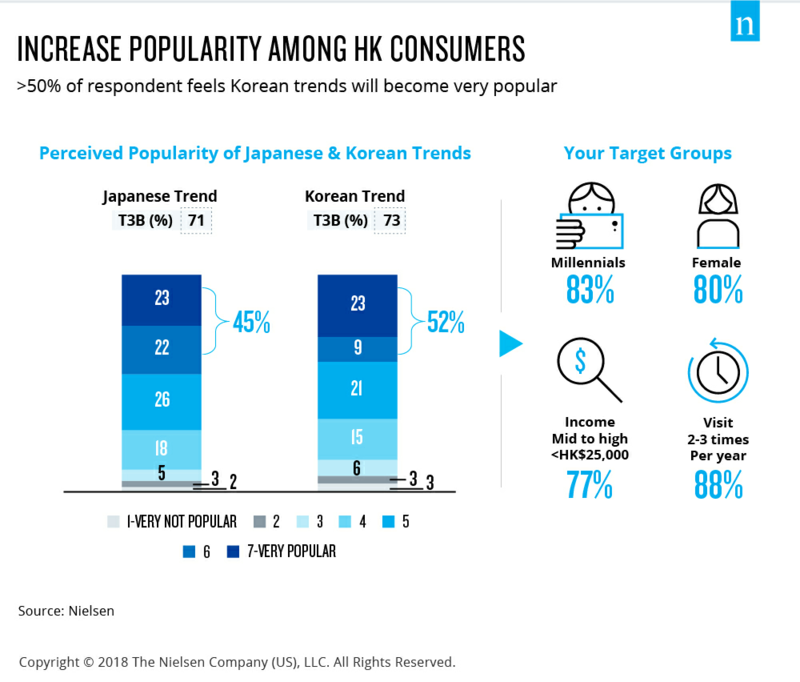 Nielsen suggests in order for Korean brands to grow even further in Hong Kong, it is important for brands to drive a higher acceptance among their target group of customers to generate a better word-of-mouth effect. Identifying effective channels to reach the target groups is crucial and can also help in maximizing the return on investment. Social media platform is still an impactful channel for the millennials to share their personal opinions and to seek advice. The online spending pattern of the millennials is also worth noting with almost half of them do their online shopping with computers at home and office (48%), followed by a respective 25% and 11% using their mobile and tablet for online shopping, according to the report. Movie-related kits and an aggressive digitial push into China are helping to propel Lego's yearly profit growth of 35% in Asia alo..
Nokia has named Chris Schaumann, its head of online sales and marketing for APAC as director, expertise and capability development..